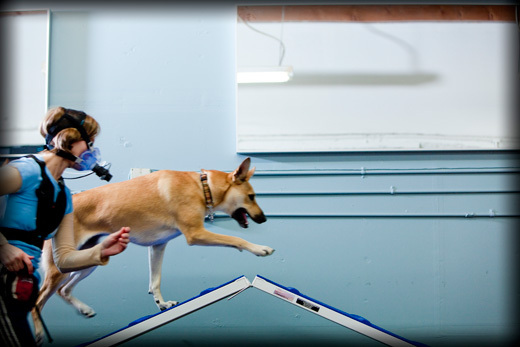 Today researchers from the University of Massachusetts Department of Kinesiology released the results from their study of the Energy cost and heart-rate responses of dog trainers during dog agility training. We are here publishing their findings for the first time. This study represents the first ever scientific examination of the physiological effects of dog agility on the human handlers. Anecdotally, having conducted hundreds and hundreds of dog agility training classes, plus weekly Agility League competitions and private dog agility classes, we’ve observed the sweat trickling down faces, the damp T-shirts and the reddened faces. But we were extremely curious to find out once and for all just what kind of a workout is dog agility? Oxygen consumption during activities was measured using a portable metabolic system. This device is a battery-operated, portable and wireless unit that measures breath-by-breath gas exchange. It was secured to the body using a vest. A face mask was connected to the flow sensor unit and detected the air flow by the rotation of a low-resistance, bidirectional turbine to measure ventilation. The expired air was analyzed for O2 and CO2 concentrations using a microfuel O2 sensor and a thermal conductivity CO2 sensor. The oxygen consumption data were analyzed scaled to body weight to allow comparisons across body sizes. In addition, a Polar heart rate monitor was worn around the chest. Heart rate was wirelessly transmitted to the Oxycon mobile laptop computer and recorded every five seconds. All collected data was finally converted into METs (Metabolic Equivalents). METs provide a convenient way to describe and classify physical activity by expressing activity energy expenditure as multiples of resting metabolic rate. One MET is defined as the amount of oxygen consumed at rest per kg of body weight. The Physical Activity Guidelines Advisory Committee also characterizes the intensity of physical activity with regard to health benefits based on a comparison of heart rate during the activity to the predicted maximum heart rate for the individual based on factors such as age. 1. When considering the Oxygen consumption data, dog agility training resulted in an average of 7.9 METs. According to the stastics above, this characterizes dog agility training as “vigorous” physical activity. 2. When considering heart rate, the average heart rate during agility training was 88% of the average predicted maximum. According to the guidelines, this heart rate also characterizes dog agility training as “hard” or “vigorous” physical activity. When a trainer is actively completing a course with their dog, the heart rate and metabolic responses are equivalent to moderate to vigorous physical activity and if sustained, would be sufficient stimulus to elicit health benefits and improvements in fitness. However, the intensity of activity is variable and is not sustained throughout a typical class. In order for participants to improve fitness responses while doing a dog training course additional “human-specific” exercises such as jumping jacks or running on the spot should be encouraged while waiting in line for a turn at the course. This is a fantastic observation and one we’ve already very much taken to heart. In other words, dog agility training can produce real fitness benefits for dog owners. But these benefits can be improved even further. And that’s why this autumn the Zoom Room will be introducing a new class to the curriculum: Canine Cross-Training®! This new class will combine agility training for your dog with speed and agility training for you! HEADED TO THE GYM? DON’T FORGET YOUR DOG! All photos courtesy of our incomparable Zoom Room friendtographer, John Ales. I thought I was working pretty hard! Good to know that it qualifies as a vigorous workout!